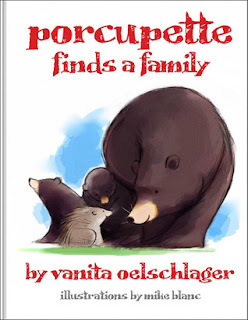 Synopsis: Porcupette Finds a Family, is a story about how a baby porcupine (called a porcupette) finds a new family after losing his mother. He wants to have an attachment to the bear family he finds, but is afraid his "bear" mother and "bear" brother and sister will leave him too. This causes him to act out his fears in ways that jeopardize acceptance from his adopted family. However, with the understanding and help of Mother Bear, Porcupette finally accepts that he is truly loved and wanted despite, or maybe because of, his differences. Review: This story was brilliant. It covers some issues that are very important for anyone who is considering adoption, has adopted, or has been adopted or is up for adoption. Things I honestly wasn't expecting to be covered. Like how sometimes when we're scared we act in ways we wouldn't normally, or that sometimes patience and love is all you need in endless supply to help someone through a rough time.